Preheat oven to 200°C (fan assist 180°C) line a baking sheet with parchment paper. In a saucepan heat the butter and water on med heat. As it starts to boil, remove off heat add sifted flour and salt and stir vigorously until all incorporated, place back on low heat for 1 minute until the dough comes away from the sides of the saucepan. Remove and place in mixing bowl to cool for 5 to 7 mins. Beat in eggs one at a time until a thick glossy dough is reached. Place dough in piping bag and using a star nozzle pipe cigars measuring 9 cm onto baking sheet. Bake in oven for 25 to 30 mins until golden brown. Remove and make a hole in the side of the puff to fill with your filling. Return to switched off oven for 10 mins then cool completely on wire rack. 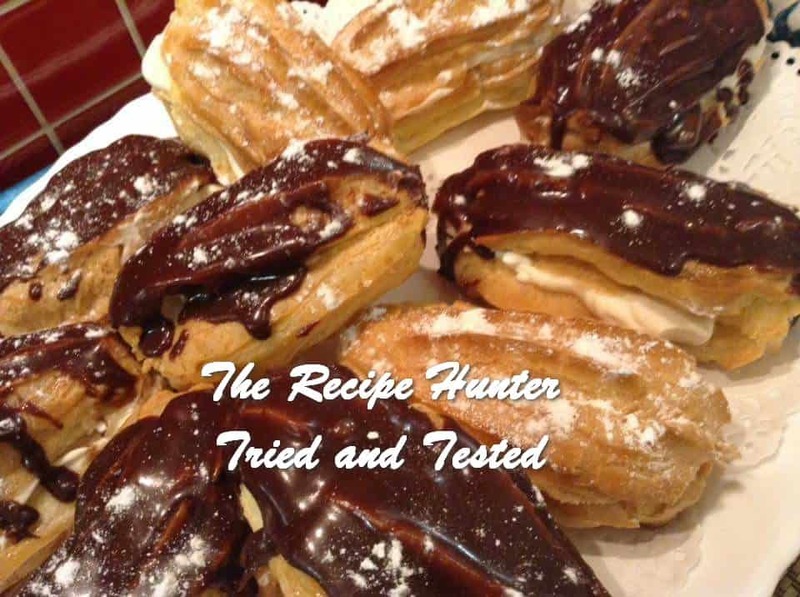 Beat all ingredients together and fill éclair. Heat in microwave on 50% power stirring at 30 second intervals until smooth and glossy. Yum, you found my weak spot. These look wonderful! Enjoy it dear !! Yes I know you love your Chocolats. Now THIS is something I want to try! Oh yummers! (photo) They look delicious, I have to try these sometime. Thanks so much, hope you will try it and also enjoy it.